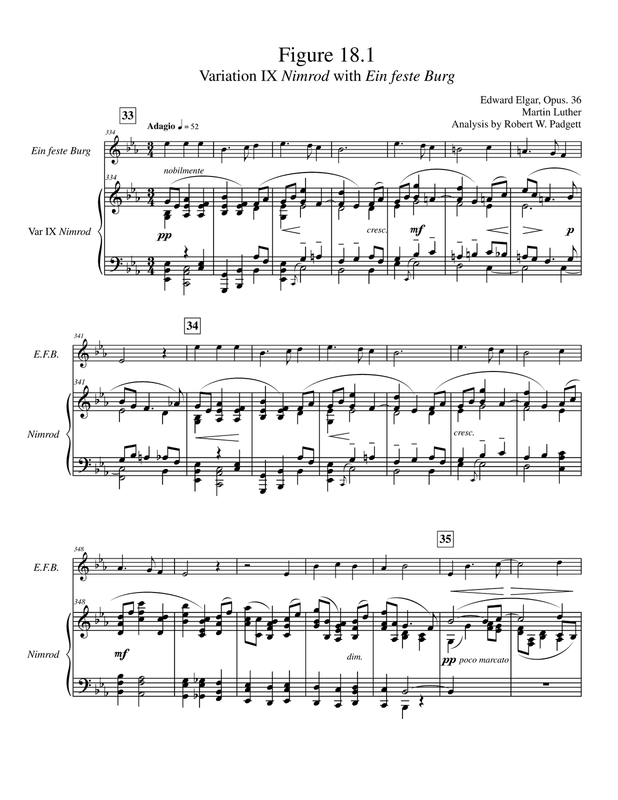 Elgar's Enigma Theme Unmasked: Variation IX Nimrod with "Ein feste Burg"
He was a mighty hunter before the Lord; that is why it is said, '"Like Nimrod, a mighty hunter before the Lord." 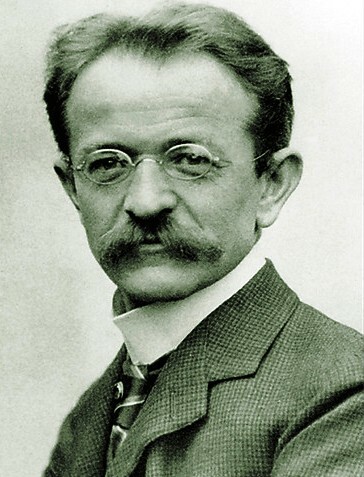 Variation IX is dedicated to August Jaeger, Elgar's friend and champion at the London music publishing firm Novello. Elgar's unusual choice of nicknames for his German friend is remarkable because its connotations spell out the covert Principal Theme's title by means of one of Elgar's favorite diversions, wordplay. For those who failed to appreciate the hunter connection between Nimrod and Jaeger, Elgar cleverly encodes his friend's initials using the Roman numerals. I stands for the number one, and the first letter of the alphabet is A. X represents ten, and the tenth letter is J. When considered together, IX translates via a number-to-letter cipher into AJ, the initials for August Jaeger. The letters AJ are an anagram for JA, the German word for yes. In contrast, the number nine is phonetic for nein, the German word for no. 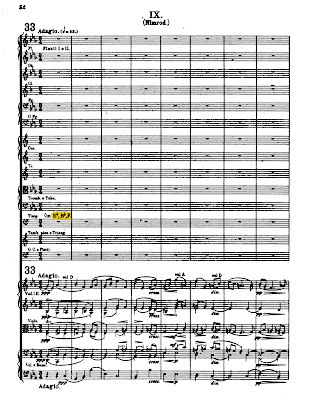 With the Roman numerals and the numbers they designate, Elgar cleverly hints at the German words for yes and no. It is remarkable that the German word for no (nein) has within it the first word from the title of the covert Theme, ein. Elgar's unmistakable emphasis on the German language serves as an important beacon, one ordinarily overlooked by mainstream scholars whose more restrained approach to language is anything but flexible or amusing. 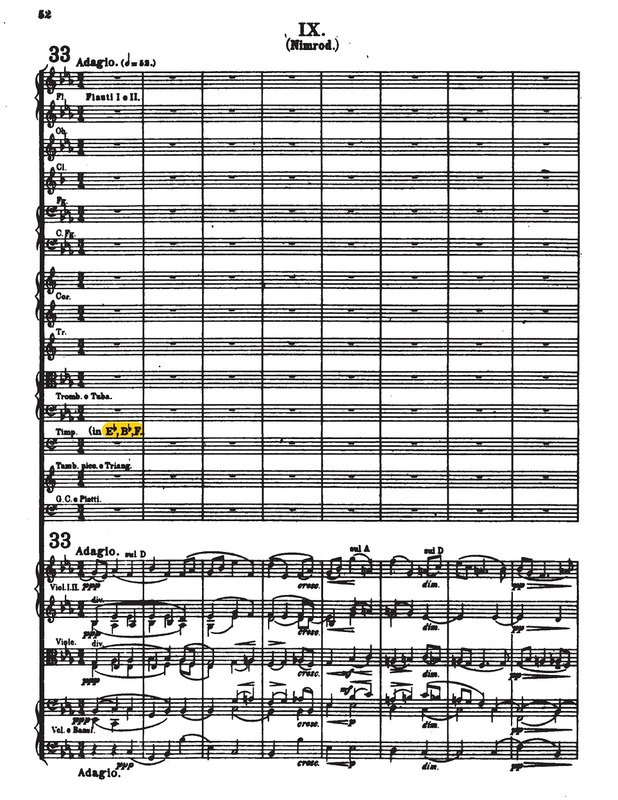 In an especially revealing bit of orchestration, Elgar indicates the tuning of the timpani for Variation IX as E-flat, B-flat, and F. These three note letters are an anagram of the covert Theme's initials. 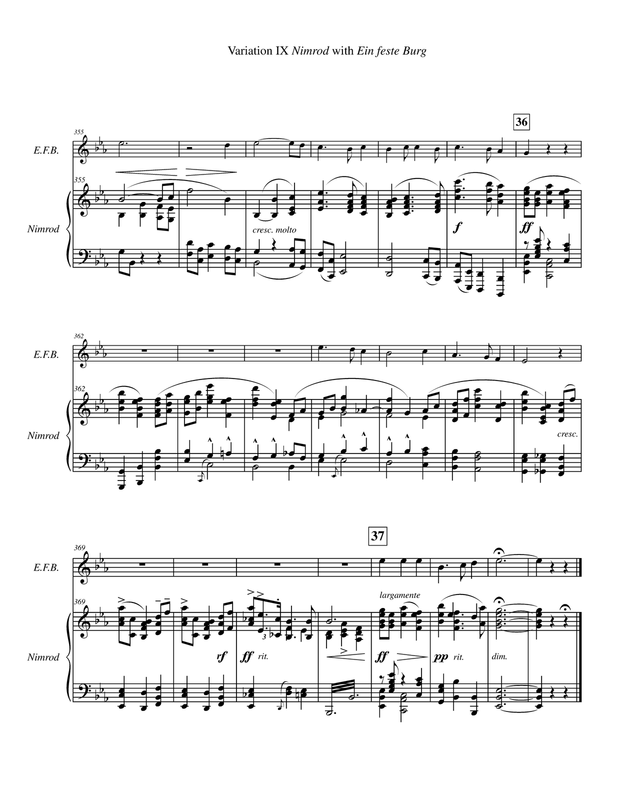 After identifying Ein feste Burg as the covert Principal Theme to the Enigma Variations, the next step was to assess whether it could convincingly play "through and over" each of the movements. The first subjected to this acid test was the most solemn and revered in the collection, Nimrod. It is feasible for Ein feste Burg to plays simultaneously with Variation as shown below. 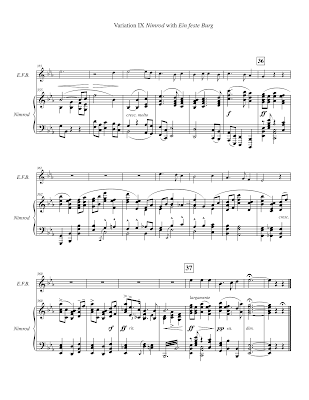 In the original 1899 program note, Elgar expressly stipulated that the covert Theme must play with each of the variations. An audiovisual file of this melodic mapping demonstrates the efficacy of this contrapuntal solution. A melodic mapping of Mendelssohn's adaption confirms this contrapuntal compatibility between Nimrod and Ein feste Burg. 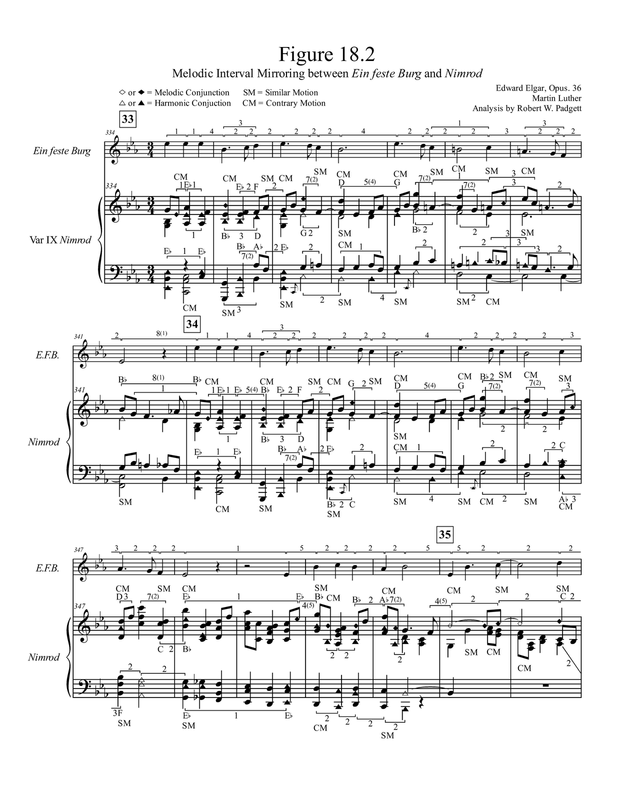 In its original form, Ein feste Burg (like the Enigma Theme) is set in common time (4/4). In contrast, Nimrod uses three rather than four quarter note beats per measure. This obviously demands some flexibility with interpolating the notes of the covert Principal Theme over the movement. 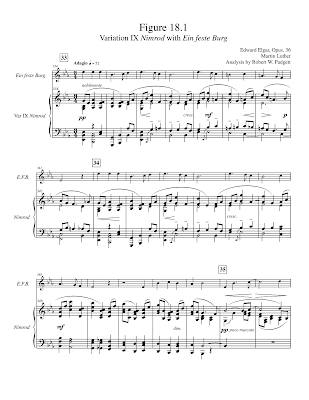 Just as Elgar more freely construed the theme in each of the variations, so too must the Principal Theme play more fluidly through and over the whole set. 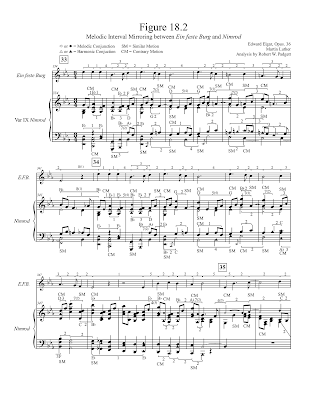 To accomplish these melodic mappings, it is crucial to take into consideration each particular movement’s meter, key, melodic and harmonic architecture. Dr. Clive McClelland correctly argues for the application of free rhythm. Figure 18.2 documents how Ein feste Burg was carefully mapped over Variation IX based on melodic interval mirroring and the principles of counterpoint. Melodic interval mirroring occurs when note intervals from Ein feste Burg are reflected in the variation over comparable or identical distances between notes. These notes do not necessarily appear in the melody line of the variation. The contrapuntal devices of similar and contrary motion were also considered in this analysis. Similar motion is when both voices move in the same direction, but not necessarily by the same degree. Contrary motion takes place when Ein feste Burg moves in the opposite direction than the variation, again not necessarily by the same interval. Similar motion is indicated by SM and contrary motion by CM. For the purposes of this analysis, similar motion includes any instances of parallel motion, and contrary motion any cases of oblique motion. An effective counterpoint typically uses a fairly balanced mix of contrary and similar motion, a feature evident in this melodic mapping. In Figure 18.2 a melodic conjunction is represented by a diamond-shaped note head and a harmonic conjunction by a triangle-shaped note head. A melodic conjunction is defined as any matching melody note between Ein feste Burg and the movement's melody line. A harmonic conjunction is defined as a match between a melody note from the covert Principal Theme and any non-melodic note from the movement. Both melodic and harmonic conjunctions must sound together to be considered a match. Table 18.1 documents 27 shared melody notes between Ein feste Burg and Nimrod, an amount just over twice that found with the Enigma Theme (13). 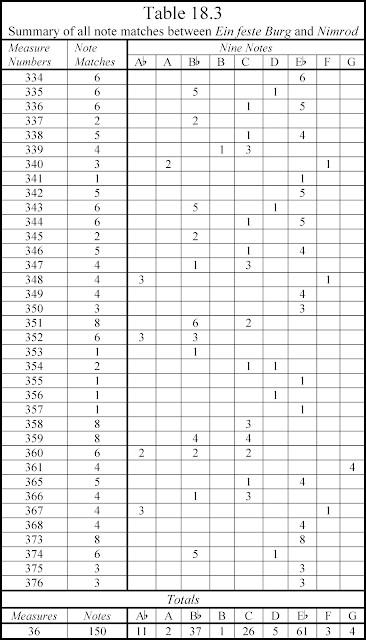 These melodic conjunctions are present from measures 334 to 373, a span of 40 measures. Nimrod is 43 measures in length with 153 melody notes, 38 of which play when Ein feste Burg is dormant in measures 341, 349-350, 356, 361-364, 368-372. 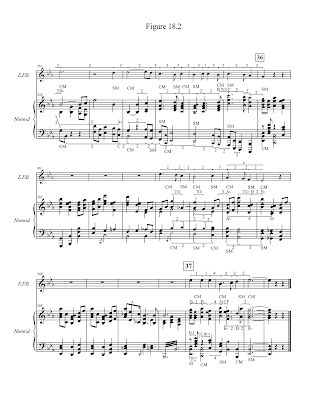 There are 79 notes in this version of Ein feste Burg, so 34% overlap with the melody line from Nimrod. Excluding dormant notes from Nimrod’s melody leaves 115 out of 153. This means 23% of Nimrod’s melody notes overlap with Ein feste Burg. Table 18.2 breaks down melodic conjunctions between Ein feste Burg and Variation IX by note type. There are 7 types of shared melody notes with frequencies ranging from 2 to 9. 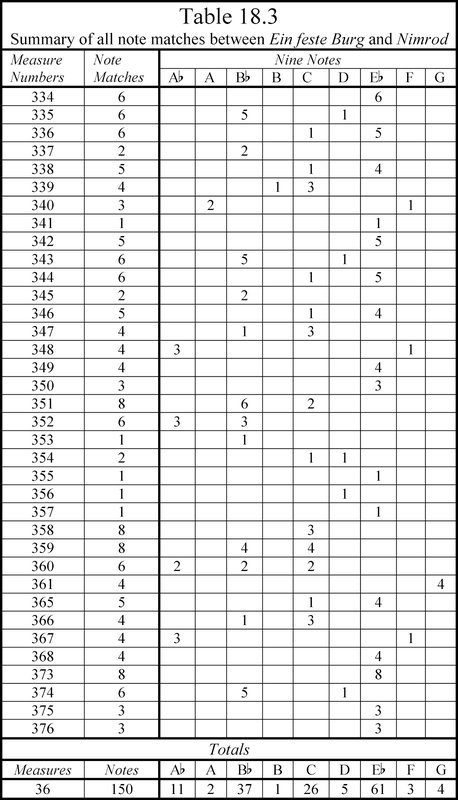 Table 18.3 identifies 150 shared notes between Ein feste Burg and Nimrod present in 36 of 43 measures, or about 84% of the movement. 27 are melodic conjunctions, and 123 are harmonic conjunctions. 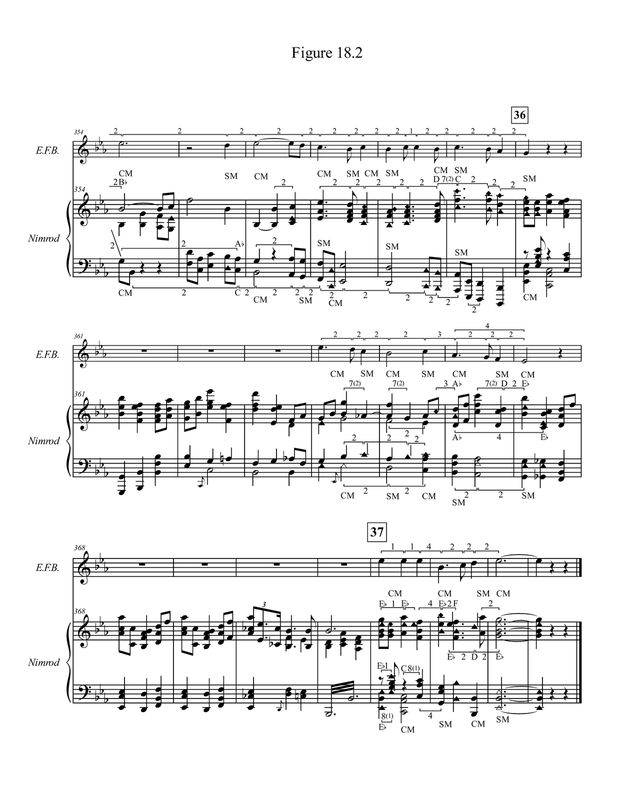 68 of 79 melody notes from Ein feste Burg are embedded sequentially within Nimrod, amounting to just of 86% of the covert Theme. 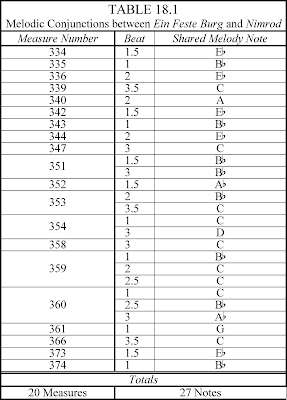 Ein feste Burg was found to be dormant over 37 quarter note beats dispersed over 13 bars (i.e., measures 341, 349-350, 356, 361-364, and 368-372). 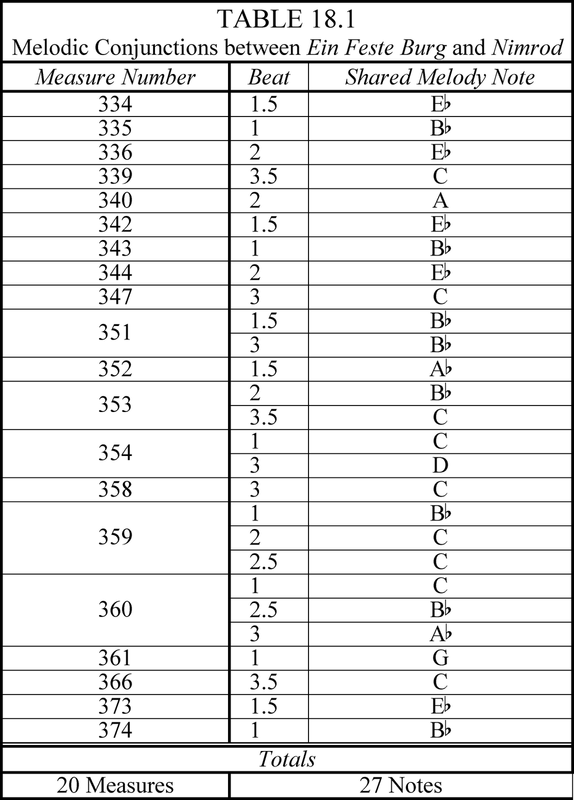 There are 9 types of shared notes with frequencies ranging from 2 to 61. Among these note conjunctions, 7 are shared by both melodies (i.e., A flat, A, B flat, C, D, E flat, and G). The preponderance of the evidence presented above demonstrates Nimrod is a clear and convincing counterpoint to Ein feste Burg. To learn more about the secrets of the Enigma Variations, read my eBook Elgar’s Enigmas Exposed. Like my heavenly Father’s gift of salvation, the price is free. I'm sorry but I think Nimrod and Ein feste Burg sound horrendously dissonant together, and no amount of diagrammatics are going to convince me otherwise. While there are a few dissonances present, these result invariably from brief but necessary passing tones. What is undeniable is there are 150 melodic and chordal note matches between "Ein feste Burg" and "Nimrod". Such a high number of shared notes is compelling evidence "A Mighty Fortress" is in fact the unstated Principal Theme to Elgar's 'Enigma' Variations. There can be 150 melodic and choral note matches between "Smoke gets in your eyes" and "Nimrod" but that in itself proves nothing. The resultant voice-leading here is atrocious, e.g. the four consecutive parallel fifths at four bars before reh. 36. You can't wriggle out from under the multiple contrapuntal infractions here by invoking "passing tones." Elgar was no avant-gardiste and his counterpoint was always impeccable. Anonymous insists there can be 150 note matches between “Nimrod” and “Smoke gets in your eyes” without furnishing one iota of evidence in support of such an outlandish assertion. If Anonymous attempts such a mapping, that party would quickly discover it is much easier said than done. In any event, the absence of just such a mapping renders Anonymous’ torpid claim empty and meritless. Anonymous would have been wise to review Elgar’s first biography before commenting, particularly the section referencing his use of parallel fifths. Facts are stubborn things, and Anonymous would benefit from consulting them before commenting. An excellent description of Anonymous’ contribution to this debate is aptly conveyed by the title “Smoke gets in your eyes.” Is it any wonder that bumbling personage posted anonymously?